Lighten up with the smallest full-featured 25-amp speed control available! The tiny microprocessor-based Sprite-25 with BEC and Brake was designed for Speed-400 sailplanes and low-current, general purpose flying. Works great with hot wind motors like the AP-29BB and the Speed-480. 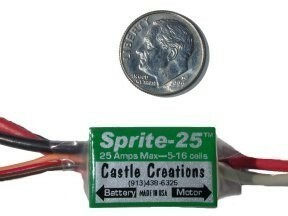 The Sprite-25 also works well with many 05 (non FAI) motors. Discontinued by Castle Creations December 2007, replaced with new product. Just a few left in stock, get yours now! Size 0.9 x 0.7 in. See next listing for Radical Deal of two for $75! Same as item listed above, but choose me and you get two for $75! 30 constant, 45 amp burst control with 5V/1.2A BEC. For use with LiPo batteries. No brake. 30 amp Constant, 45 amp burst control with 5V/1.2A BEC. For use with LiPo batteries. With Brake.